Microsoft SQL Server supports connections to other OLE DB data sources on a persistent or an ad hoc basis. The persistent connection is known as a linked server. An ad hoc connection, that is made for the sake of a single query, is known as a distributed query. A distributed query can be run without creating a linked server first, by using the Transact-SQL OPENROWSET and OPENDATASOURCE functions. When executing a T-SQL statement against a linked server, the OLE DB provider (e.g. OLE DB Provider for Jet) for the linked server is loaded into the SQL Server memory address space, then SQL Server takes the T-SQL statement and calls the OLE DB interface. Then the OLE DB interface provides a connection to the remote data source (e.g. Excel file). The OLE DB provider then processes the result set and returns the results to the SQL Server client that made the initial call. In this article we’ll show how to create a linked server to query Excel data from the Excel file (*.xlsx) using the Microsoft.ACE.OLEDB.12.0 OLE DB provider and also how can be done by using the OPENROWSET and OPENDATASOURCE functions. To import data from an Excel file (Excel 2007 (xlsx) and above) to SQL Server the Microsoft.ACE.OLEDB.12.0 OLE DB driver should be installed. The Microsoft.ACE.OLEDB.12.0 OLE DB driver can be used on SQL Server 32-bit editions for Excel 2007 files, or later, or on SQL Server 64-bit editions for any Excel files. There is one more provider; Microsoft. Jet. 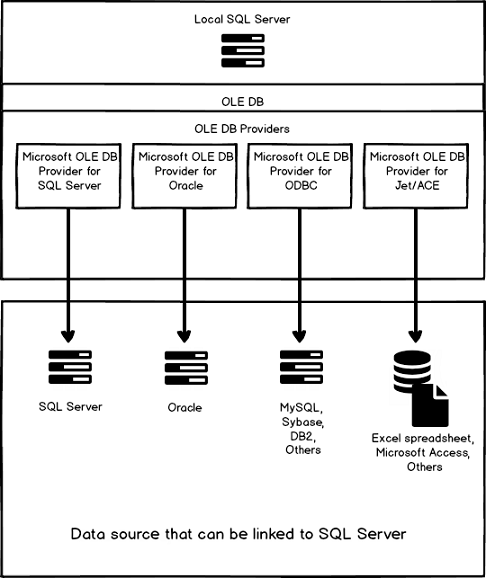 OLEDB.4.0 which can be used on SQL Server 32-bit editions for Excel 2003 files (or earlier). In this dialog, the name of a linked server and server type must be identified. In the Linked server box any name for the linked server can be entered (e.g. ExcelData). In the Product name box, put the name of the OLE DB data source to add as a linked server (e.g. Excel). In the Data source box the type the full path and file name of the Excel file (e.g. C:\Test\Excel_Data.xlsx). Note, if you are using the Excel 97-2003 (.xls) files, in the Provider string field should be enter “Excel 8.0”. Cannot initialize the data source object of OLE DB provider “Microsoft.ACE.OLEDB.12.0” for linked server “EXCELDATA”. More about creating a linked server using T-SQL can be found on the How to create, configure and drop a SQL Server linked server using Transact-SQL page. Now that the linked server is created, let’s query some Excel data! The OLE DB provider “Microsoft.ACE.OLEDB.12.0” for linked server “EXCELDATA” reported an error. Access denied. Cannot obtain the required interface (“IID_IDBCreateCommand”) from OLE DB provider “Microsoft.ACE.OLEDB.12.0” for linked server “EXCELDATA”. This usually happens because of inadequate permissions. This will list all data from Sheet1 of the Excel_Data.xlsx file. After all these settings, you are still getting the same error, maybe Microsoft Data Access Components (MDAC) do not be work properly. For more information, see this Microsoft article. To access data to an Excel file via SSMS without creating a linked server first use the Transact-SQL OPENROWSET and OPENDATASOURCE functions. Like linked servers, OPENROWSET and OPENDATASOURCE use OLE DB to connect to the remote data source; however, these functions do not encompass all the features included with linked servers, which is generally why linked servers are the preferred option. To boost your SQL Server development productivity, check out Free SQL Server Management Studio add-ins.